This entry was posted in language skills, Listening and tagged egzaminy MON, level 3, listening, listening resources, military English, mock exams, poziom 3, SLP 3333, SPJ 3333, STANAG tests, tests, wojskowy angielski on 09/11/2016 by Paweł Jasiński. After one year of being inactive online it’s high time to take into military English business again. The site has undergone serious changes already. First of all, you will immediately notice a new look and a layout of the website. Now, the layout is responsive so it means that while browsing it on mobile devices you will see a device-tailored window. It’s more easy to browse now. The troublesome audio files were rearranged too. The audio files are stored on Google Drive now so no more problems with playing recordings. You can either play any recording in a seperate window, either download it directly from the same window. The previous hosting and embeded player caused some users having problems. Now, your experience should be much better. Due to SlideShare policy and technology implemented by this third party, users of Google Chrome cannot play slide show of the presentations shared on the site. Other browsers support SlideShare presentations so try them whenever you want to access those presentations on Stanag6001.com. For those devoted to Chrome, there are links provided, leading to Slideshare website where viewing works well. We hope you will enjoy a new, lighter and responsive website. This entry was posted in Uncategorized and tagged important notice, listening, listening resources, Stanag6001 tests, tests on 08/24/2016 by Paweł Jasiński. As the base for pre-class students’ preparation I used the article from “The Guardian.” It is about the British troops serving in Afghanistan and their problems there. A big portion of the article online deals with British patrols‘ experiences and the problems they faced in Sangin. In subsequent slides of my presentation below, I dealt with radio communication in English and the basic rules every radio traffic features. As an illustration for the radio communication exercise I used assorted Internet sourced pictures. Each picture requires from students reporting different events and settings. There is a theory of radio communication provided along with some examples how the communication could possibly look like. The students had necessary details already in the pictures provided or in additional notes/graphics included. It’s up to the students to decide what to use and how to compose the radio messages. Skype works perfectly when simulating radio traffic, especially in a conference mode with more than just one attendee. This entry was posted in general English, Listening, Speaking and tagged listening, listening resources, military English, radio communication, speaking, speaking topics, wojskowy angielski on 01/10/2015 by Paweł Jasiński. The game board – one sixth of the featured sketch. 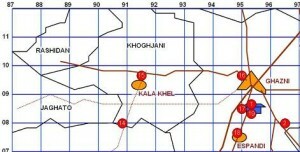 Ghazni area of Afganistan. pratice military jargon in real military situations with non-military teachers was even harder to perform. But this year I’m going to change this situation a little! Let me explain to you what the whole concept is about. This entry was posted in Listening, Reviews, Speaking and tagged board games, listening resources, military English, reading comprehension, tactical games, wojskowy angielski on 03/11/2013 by Paweł Jasiński. STANAG 6001 test – courtesy of CEBFL in Poland. You can practise it on-line. The whole test is designed to test your listening comprehension within 35 minutes. Any time the break is required, you will be informed and must count this time yourself. All tasks recordings are played twice during exam. For questions 1-7 please choose the best answer a), b) or c). You now have one minute to look through the questions for Task One. You can play and/or download the task 1 here. This entry was posted in language skills, Listening and tagged egzaminy MON, level 2, listening, listening resources, military English, mock exams, poziom 2, SLP 2222, SPJ 2222, STANAG tests, tests, wojskowy angielski on 02/22/2013 by Paweł Jasiński. STANAG 6001 test derived from the Central Examination Board for Foreign Languages of the Ministry of National Defense (CEBFL) in Poland. It was adjusted a little to make it easier for the site visitors to practise on-line. The whole test is designed to test your listening comprehension within 35 minutes. Any time the break is required, you will be informed and must count this time yourself. All tasks recordings are played twice during exam. You can play and/or download the task one here. This entry was posted in Listening and tagged level 2, listening, listening resources, military English, mock exams, poziom 2, SLP 2222, SPJ 2222, STANAG tests, tests, wojskowy angielski on 02/21/2013 by Paweł Jasiński.